Your Complete R2R J2534 Solution! Drew Technologies continues its tradition of providing the most validated J2534 devices on the market. The CarDAQ-Plus®3 is the only pass-thru that offers the following features in a single device. 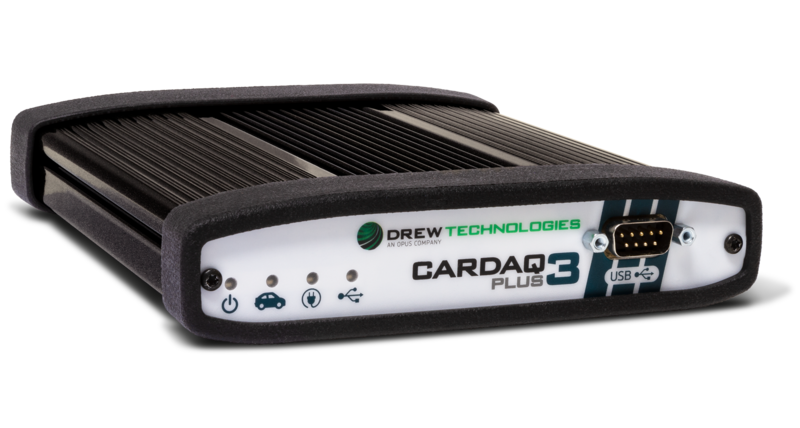 The CarDAQ-Plus®3 is the next generation Drew Technologies fully supported SAE J2534-1 and J2534-2 device with even more advanced support including: CAN FD, 4 CAN Channels, v05.00 API and DoIP. •et; CAN FD: Supports Flexible Data Rate CAN. (being introduced in the near future). •et; J2534 v05.00 API: The newest version of J2534 to give you the latest in pass-thru technology. •et; 4 CAN Channels: Going beyond the 3 required by select Chrysler/FCA models. CarDAQ-Plus®3 also provides a 4th to meet the needs of future OEM applications. •et; DoIP: Automotive Ethernet for advanced vehicle communications. In addition, it features High Speed USB and support for global vehicles. 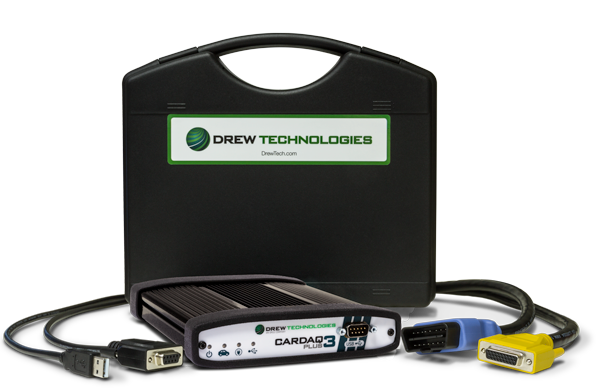 Drew Technologies fully tests our devices for compliance and meet all of today's SAE J2534 standards. OEM's globally trust Drew Technologies and approve our tools for their dealerships as well as their Engineering uses, such as: testing, software development, EOL testing, and more. Consider Drew Technologies for your custom solutions needs too. For a brief overview of the CarDAQ-Plus®3, download our new Sell Sheet! light-duty all the way to heavy-duty jobs. • SAE J2534-2: CarDAQ-Plus® 3 offers extra J2534-2 support that expands reprogramming beyond just the Engine/Trans modules for GM, Ford, Chrysler, Toyota, Honda, Audi, VW, BMW, Volvo and more! • Technicians and Locksmiths use the CarDAQ-Plus® 3 for Security Key systems/reprogramming on all vehicle makes supported by the OEM and through the NASTF SDRM model. • Click HERE to learn more and register. • Click HERE for a listing of OEM availability of Key Codes, PIN codes, Immobilizer/ Smart Reset Codes. • J2534 Toolbox 3 - Your personal assistant to help you thru the process, including: videos, walk through help guides, FAQ's, and other online support. • Free, live telephone and email support from 8:30am - 5:30pm EST for all of our Drew Technologies products. • Supports Windows Vista (32/64-bit), and Windows 7 (32/64-bit)), Windows 8 (32/644-bit), Windows 10 (32/64-bit). For more information, contact our Sales team at 877.888.2534 (option 2) or email sales@drewtech.com.